If you’ve never gone to war or if you’ve never had to stay behind when your spouse is deployed, you can never fully appreciate the worry, loneliness and hardship of trying to raise a family not knowing if or when the family will be together again. Or how the returning veteran will be changed by the experience. Michael Gurian, renowned therapist, author and parenting expert, claims that a mother and a father need the help of extended family and community if their children are to grow up to be happy, strong, successful adults. How much more difficult this will be for a mother whose husband is absent! 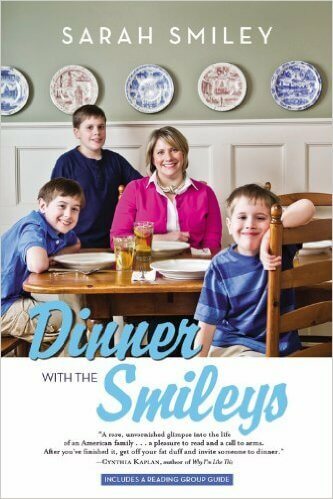 Sarah Smiley tells her moving story in her book, Dinner with the Smileys, which she also summarizes in her article in Parade magazine. When her husband left for a one-year overseas tour, the family decided to invite an adult from the community each week for dinner. They started with the kids’ teachers, but then invited the chief of police, a U.S. senator, a former governor, artists – over 60 people from many walks of life, including less fortunate people. These dinners led to friendships, activities and field trips, an incomparably broadening experience. With creativity and optimism, Sarah transformed a potentially disturbing time into a uniquely educational and formative experience for her kids. It does take a village to raise a child to be the kind of adult you hope for. And there are many, many ways to create this village.